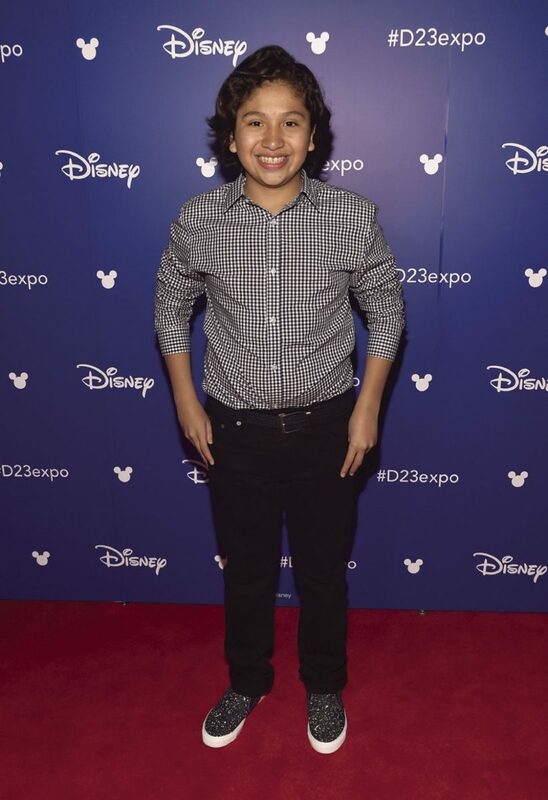 Actor Anthony Gonzalez of COCO took part in the Walt Disney Studios animation presentation at Disney's D23 EXPO 2017 in Anaheim, Calif. COCO will be released in U.S. theaters on November 22, 2017. Disney’s latest animated feature, “Coco,” is the story of a 12-year-old singer and musician named Miguel who dreams of performing like his idol, the famous Mexican musician Ernesto de la Cruz. He has even constructed his own guitar and taught himself to play. However, music is forbidden in his family due to his great-great grandfather leaving the family to pursue his dream. As Miguel must choose between devotion to family and his love of performing, the film alternates between the parallel worlds of Land of the Living and Land of the Dead on the celebration of Día de los Muertos as the young man tries to solve the mystery of his family’s ban on music. In support of the film’s in-home release on digital (Feb. 13) and Blu-ray (Feb. 27), Festiva contributor Brooke Corso sat down with its star and voice of Miguel, Anthony Gonzalez, at the JW Marriott in Houston on Feb. 12, to discuss the actor’s background in music, experiences in the film, and plans for the future. FESTIVA: You’ve been a performer since you were very, very young, and live performing is all about connecting with your audience. As you’ve developed your act and stage presence over the years, how do you connect with your audience? ANTHONY GONZALEZ: I feel I connect with my audience by really understanding the message I want to give people. I really love to give positive messages and inspire other people and children. That’s why I love singing and acting — because I want other people to follow their passion and do what they love to do. F: What do you think is the most nerve-wracking environment in which to perform: on the street, up on stage, or within a sound booth (as in voice work for animated features)? AG: Well, singing in a booth is what I did for “Coco” so I’m kind of used to that. I’ve sung on stages a lot and I’ve also sung on the street so I’ve done all of them. The one I enjoyed the most would probably be on stage because I can see everyone and interact with everyone. F: In (“Coco”), Día de los Muertos is the structure around which the whole movie is organized, and it kind of counters the negativity of death — the painfulness or frightening (aspects) — by showing the positivity of it. How do you honor your ancestors in your life? AG: I actually started celebrating the Day of the Dead when I was six years old because my grandfather passed away. He was very special to me because he would always support me and be there for me, and he was just someone I could always rely on and talk to. Once he passed away, I started celebrating it. I already knew about it but never really celebrated it because no one had passed away who was really special to me. When you celebrate the Day of the Dead, you connect with your ancestors and family members and you can be with them again. That’s what I love the most about this [film] and I’m so happy they put it in the movie because now a lot of other people know about the celebration who at first didn’t even know what it was, they thought it was like Halloween. Now they know what Day of the Dead is and they want to celebrate it, too. I feel that is amazing, and the way I celebrate it is by putting up el altar and pictures and food. It’s just great to remember your family members and loved ones and I feel Coco did a great job of showing that to the rest of the world. F: I liked how you talked about celebrating your ancestors. Are there any traits that, as you’ve gotten older, you’ve seen that your ancestors have passed down to you or that family have noticed in you? AG: Yeah, my parents tell me all the time that I’m just like one of my uncles or their uncles because they loved to sing a lot. Just like I sing all the time, everywhere, they think I look like him. It’s really my passion — that’s why I do it a lot. I’ve sang all the time since I was four years old because I knew I wanted to do it for the rest of my life because I enjoy it so much. F: I don’t want to say “on a normal day” because for you, this may be your “new normal,” so on a “quiet day” when you don’t have to work or do interviews or press, what do you like to do to unwind? AG: Before, I was in regular school so I would probably just go to school, do homework, and relax. Now, I’m homeschooled this year so it would be kind of different, so on a quiet day if I was not in L.A. I would probably explore or hang out at the hotel with my mom. I love to explore, go outside, like last time I was in New York doing press for “Coco,” I had nothing to do that day so my mom and I went to Times Square and we explored there. We also got some bikes and biked all the way from 27th Street to Central Park which is like the sixtieth street, and we biked in Central Park but once we figured out we still had miles and miles to go [laughs], we just stopped and went back. So on a quiet day, I would probably do sports. I love sports like soccer and basketball, and since I have two brothers which I spend most of the time with, we would play video games and just hang out. F: You talked about exploring cities like New York and I’m sure you’ve explored a lot of Los Angeles. You have extended family in other countries — have you had the chance to travel there? AG: I’ve never had the chance to go there, but I’d love to at some point this year. I have a lot of family in L.A. and a lot of family in Mexico. I’ve only been to Mexico once for a singing competition, but I’d love to go again and see some of my family members. I love going to Mexico because I really love the food and just explore there. F: Tell me about your new film, “Icebox,” which is more serious and intense. AG: I recently finished doing “Icebox,” which is about the process that kids go through in immigration. I had so much fun doing that. I did that in Albuquerque, and did the short film as well but that was in L.A. It’s produced by James L. Brooks, the producer of “The Simpsons.” Now, they are just finishing it up, editing it and ready to put it in a lot of festivals and sell it. After that, keep following my dream and passion and auditioning. F: Now, I’m going to ask a “teacher question” because as an educator for 10 years, it comes natural to me. At the beginning of the year, I would ask my students to write down a goal for the year and seal in an envelope; at the end of the year, we would open the envelopes and see what progress was made in achieving that goal. Think back to early fall, before the movie came out: was there a goal you had for the year, and have you achieved it yet? AG: In September, probably a goal I had before the movie came out with my work in “Coco” was to inspire a lot of other kids that had a dream. What I wanted kids and people to take from this was to do what they love to do and follow their heart. If you have a passion, no one can bring you down or stop you. Follow your heart and what it has to say. Yeah, I feel I have accomplished that because I’ve seen a lot of kids now doing what they love and following their dreams. I’ve seen a lot of kids picking up a guitar and learning how to play it. I’ve seen a lot of kids singing now. A lot of kids have Coco guitars which makes me feel so good and I’m so proud I inspired so many little kids out there and it’s just a big deal for me. F: One more “teacher question”: Your world is infinitely bigger than most 7th or 8th graders, but I would always ask my students to envision themselves five years into the future. For you, who is someone you would like to have acted with and sang with by the time you reach your late teens? AG: That’s hard! (laughs) I would love to work with actors like Tom Hanks or Johnny Depp or Benjamin Bratt (Ernesto de la Cruz in “Coco”) again would be amazing. Some of my costars in “Coco” again in the future on another project would be so cool. Someone I would want to sing with: I love Ed Sheeran or Shawn Mendes. I love hearing their songs and think they are amazing. Bruno Mars, those are the singers I love a lot. Obviously, mariachi singers like Alejandro Fernandez or Pedrito Fernandez. There’s obviously some people who I grew up hearing that made an impact in mariachi music but they passed away. I love mariachi and pop and all types of music. F: Congratulations and I’m so happy for your success. It was so nice to talk to you. AG: Thank you, it was nice to talk to you, too. F: You can add them, I haven’t stopped recording! AG: (excitedly) OK, I would love to work with Sofia Carson, Dove Cameron — I love “Descendants.” Cameron Boyce. Zac Efron obviously and Zendaya are just so amazing. What else? Hugh Jackman and Angelina Jolie — I got the chance to meet her at the Emmy Awards, so that was amazing.